Should Colorado allow marijuana delivery to homes in your neighborhood? DENVER — The Colorado legislature is debating a bill co-sponsored by Rep. Jonathan Singer, D-Longmont, that would legalize home delivery for medical marijuana starting in 2020 and recreational marijuana delivery in 2021. 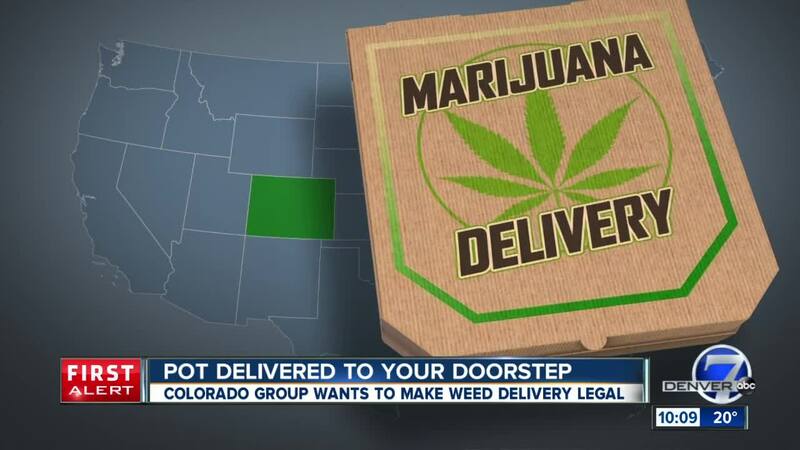 Each Colorado city can choose to opt in or decide not to allow delivery under Singer’s bill. Denver7 is taking a 360 degree look at various viewpoints on this issue and what some see as pros and cons. Medical marijuana user David LaRose says delivery would simplify his life. While in the U.S. Marine Corps, his head was smashed between a service door and the side of the airplane. He says he started having seizures shortly afterward. "I was actually driving and had a seizure and got into a car accident," LaRose said. Marijuana helps him have fewer seizures, he says. He is no longer allowed to drive. There have been times during snowy weather that friends haven’t been able to drive him to a dispensary. Bus service where he lives in Colorado Springs isn’t convenient. "To get to a dispensary it's a five-mile walk," he said. LaRose suffers from PTSD and feels marijuana helps him ward off a seizure when he feels one coming on. LaRose says it simply shouldn't be difficult to get medicine that he feels helps keep him out of the emergency room or urgent care. "The delivery service would be absolutely perfect for me," he said. Aurora Police Sgt. Scott Pendleton investigates the illegal side of marijuana. He worries gun-carrying criminals will intercept deliveries and go after the drugs or the cash that drivers carry. "Inviting potential violent crime to your neighborhood or the house next door is certainly not something that's desirable," Pendleton said. "It creates yet another avenue for criminals and for people to be victimized with violent crime." The dominant view among law enforcement is trepidation about making marijuana delivery legal. Jason Thomas disagrees. Thomas was a member of law enforcement as a marshal in Holly, Colo. — along the Colorado-Kansas border about four hours from Denver. He says people already deliver on the sly and a legal delivery system would make the deliveries regulated and tracked. Thomas’ view is that if people could get pot delivered to their door legally, they would stop buying it from illegal delivery drivers that exist underground. "The fewer avenues that the black market has available to it, obviously the less demand that the black market will have," he said. Denver businessman Tim Ruybal, of Dyspense Technologies, has built a whole software package to track, organize and run marijuana deliveries. He currently manages shipments of marijuana between dispensaries only, but wants to expand to the home delivery business if it becomes legal. He also stands to earn cash if dispensaries that deliver marijuana use his software. “Hundreds of millions of dollars,” he said of the money he hopes to earn through home delivery. His software tracks delivery vehicles by GPS. Every box carrying cash or marijuana also is tracked. His software can send alerts if a driver is stopped for too long or goes on roads or highways where they shouldn't, for example, to a home that is too near a school. Police will be able to see information if there's a crime. His delivery cars aren't marked. Crime has not been a significant issue for him. "There's not been any drivers that have been held up at gunpoint," Ruybal said. Rep. Singer, who says he has never used marijuana, believes people have a right to get medicinal or recreational marijuana conveniently. "We don't turn away people from their pharmacies. We allow people to get their medicine delivered to them," he said. The plan is to have drivers carry only marijuana products that have been previously ordered, similar to how a pizza delivery driver only carries pizzas for customers who have placed an order. Though all details haven’t been worked out, he thinks the state can find a way to do it safely. "I don't hear [skeptics] worry so much about Fed Ex trucks being knocked over everyday," he said. California is way ahead of Colorado on the issue and has had marijuana delivery in place for years. Depending on the individual city and its rules, some drivers leave a dispensary in the morning and stock their vehicle with marijuana they expect to deliver — based on past history for a region, the date and time. In other places in California, drivers only carry marijuana to fulfill existing orders. It’s hard to know how marijuana delivery has affected crime overall. The spokeswoman for the state’s largest marijuana delivery company, Eaze, says crime has not been a significant factor for drivers or customers that are affiliated with. "Less than .001% in the over 3 million deliveries we've made," said Sheena Shiravi, Eaze’s Communications Director. Rep. Singer says he expects Governor Jared Polis to sign the bill should it reach his desk. A spokeswoman for the Governor’s Office says he is supportive of the concept, but is still reviewing the specifics. The bill is in the House Finance Committee and must pass a vote there before lawmakers in the House and Senate can send it to the governor. The legislative session is set to end May 3. Viewers have shared their opinions after we announced our story on Facebook. Marijuana customers using the drug while driving concerned at least one person. Editor's note: Rep. Singer represents Longmont, which is in Boulder County. A previous version of this story suggested Singer represents the City of Boulder.